« ‘My Father, The Assassin’ – Most Popular Book on FirstChapters! I am full of enthusiasm this morning, as I have so much to tell you about the last seven days in our lovely spot on the edge of Chianti. Farty Barty stays out of reach on Vets day. 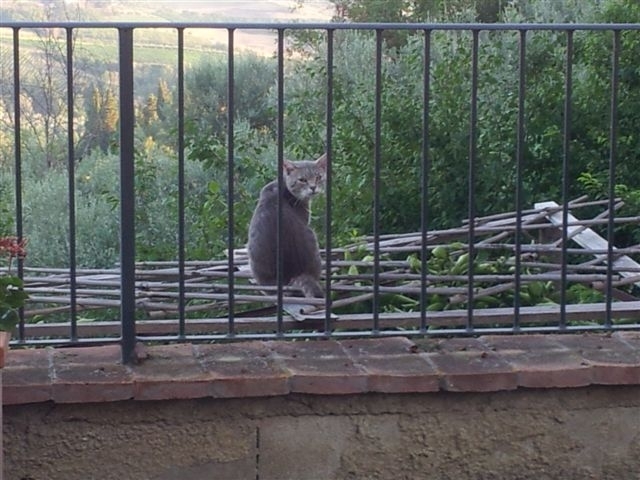 Yes, it’s true, my man and I, not forgetting Farty Barty the cat, are very lucky to be here and we celebrate this fact every evening with a nice chilled aperitivo on our upper terrace. Yes, there is a lower terrace, otherwise we would not have an upper one would we? On the subject of the garden and my man, you may recall that the latter has had an ongoing battle with the pretty dark red furry ones, that love to throw the sharp remains of pine nuts on his head. 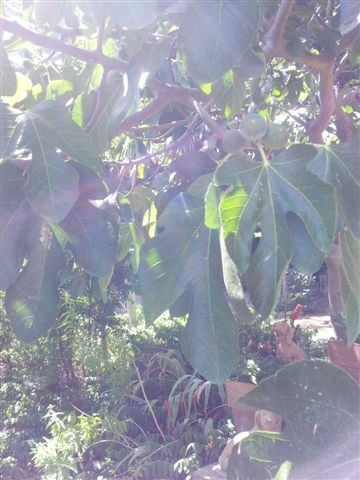 Now the little devils are eating the ripe figs! We have yet to see the Pine Martens, but we know they get together with the squirrels at night, have midnight fig feasts, and leave us with nothing but small hard green ones. I don’t mind this at all, I like to think that the garden attracts all and sundry from the countryside. My man thinks the squirrels may be eating the young courgettes too, however, I say that if you can’t see any tooth marks then it’s not them, but a sneaky wild pig (cinghiale) with a straight blade knife. I have already talked a lot about the very noisy cicada, but with hand over my mouth and trying not to snigger, I must tell you that my man is also being dive bombed by these flying insects every time he walks under a tree! Well enough of that. Back in Fiano, our local village, the pensioners were queueing up for their pensions outside La Posta. This is a first of the month event, and takes all morning to pay everyone out. There is only room for four people inside, so the poor things have to queue outside in the hot sun. I know most of these lovely people by sight and we always exchange ‘Buon Giorno’s’. For some reason I stopped and asked (in Italian of course) a few familiar faces why they don’t have their pensions paid into the bank. This was a silly thing to do and no sooner had I opened my mouth, I knew the answer. Cash is king here in Italy. The minute you bank anything it is taxed and it is up to you to claim it back if you think you are entitled to do so. A few years ago I made the mistake of opening an account with one hundred euros. I never got to use the account, then a several months later I received a statement and the whole balance had been swallowed up by tax and bank charges! Ouch…. It is the start of August, and here in Tuscany everything is winding down. This is traditional, as all Italians, if they can afford it and many can’t this year, are packing up and leaving for the coast or the mountains where the air is cooler. If you are reading this and intend coming to Tuscany this month, think again! Eighty percent of shops, restaurants and bars close for at least two weeks in August and sometimes for the whole month. We are already seeing tourists wandering around what to them, must seem to be ghost towns and villages. Poor Laura and her daughter in the Bar/Alimentare in Fiano, have been working in inside temperatures of forty-two degrees and are quite rightly closing in the afternoons. We go there every morning for our Espresso coffee fix and yesterday my man had to bury his red face in the newspaper, because he had eaten the last Pasta di Marmellata and a disgruntled local wanted to know why it had not been kept back for him! 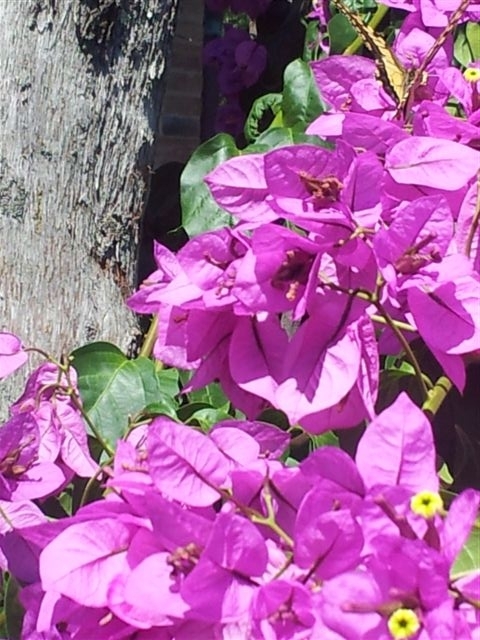 Bougainvillea with butterfly top right. And now to the subject of butterflies. Yes, I am talking about those beautiful fluttering things that visit the flowers for their nectar. I have been frantically trying to photograph a really big one, so that I can find out what it is and send you a picture. But would you believe it, just when I think I have captured the perfect shot it waves good-bye and is off. However, this has resulted in some lovely pictures of the Bougainvillea, which is winding its way up the bottom of a fir-tree from the lower terrace, so you can at least enjoy one of those. If you strain your eyes, you might just see a bit of butterfly top right! If you can identify it, please let me know. Poor old Silvio Berlusconi has had a hard time this week. In the empty court a carabiniere (policeman) got so bored after seven hours of waiting for the judges to return with their verdict, that he broke into a spontaneous dance and white-gloved moves apparently inspired by the Village People’s hit song YMCA. It’s now hugely popular on YouTube! You can smile at this, however, the final verdict was not even a tiny bit funny from Silvio’s point of view. This is a very rich man, with many questionable connections and he likes pretty girls. He has been Prime Minister of Italy three times and has a massive right-wing following. According to some of the people in our local bar, he is the perfect target for jealous left-wing politicians and judges. When seeking election some years ago Silvio quoted ”Out of love for Italy, I felt I had to save it from the left.” So, whatever your point of view, as Silvio declared in May 2010 ‘As prime Minister, I never had the feeling that I was in power…..’ No picture today as he is currently looking too sad. But watch this space, he’ll be back! Well it’s time for a relaxing aperitivo and then lunch at ‘C’era Una Volta’ in Lucardo. Have a good week and do get in touch.